Deep retrofits can sometimes go so far that they’re effectively new builds in everything but name. Others tinker at the edges of the thermal envelope without really tackling the building’s fundamental problems. This Bristol retrofit and extension is different. Here, the design and build team expertly walked the line between the possible and the practical, to deliver high comfort, low energy living. Ian Mawditt — owner and designer of the project — is an independent building performance researcher. As such, he could hardly be better placed to embrace the challenges of retrofitting this 1962 detached two-and-a-half storey home, on the fringes of Blaise Castle Estate in Bristol. 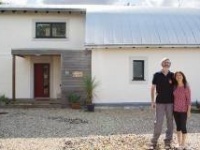 Before moving to Bristol from Oxford, Mawditt and his wife Corinne had been thinking in terms of retrofit, if the right property came along. But when they pulled up outside the nondescript 1960s house they had arranged to see with the estate agent, they took one look and decided that it wasn’t for them. When they got inside however, they discovered that the house had been built into a hill, and that the back garden fell away steeply, putting the ground floor at tree-top level. In addition to recasting the building’s thermal and comfort profile, the project also involved converting a storage space on the lower ground floor into a kitchen/diner, and adding a side extension. The project also set out to address the house’s nondescript facade, and give it a more engaging aesthetic. The key challenge on the build was apparent to Mawditt almost as soon as he pulled up to the house that first day. Like so many buildings of this era, concrete elements were everywhere, from the gutters to the steps to the balcony at the back. Great for stability, but not so good for thermal bridges. Everywhere he looked, he could see clear evidence that any attempt to upgrade the building envelope would be futile without tackling those thermal bridges. When he examined the roof more closely however, Mawditt saw that despite the fact that it was more than fifty years old, it was still in good condition. But he says that while the ideal solution would have been to install a completely new roof, doing so would have blown his budget. While Mawditt himself worked on the overall design, he brought in Ruairi Kay of Taylor Kay Architects to work up the detailed drawings that would guide the work and allow them to go to tender. Kay had amassed significant retrofit experience working on the Retrofit for the Future programme run by the Technology Strategy Board (now Innovate UK), and had encountered houses of similar style and vintage to Mawditt’s. Kay explains that he worked on eight separate solutions to the guttering problem, ranging from taking off the roof to leaving the gutter untouched and using internal insulation to mitigate the thermal bridge. The former, as Mawditt pointed out, was impractical, wasteful and expensive. The latter wouldn’t have gone far enough. Then there was the balcony. This was an extension of the ground floor slab that extended into the external space. Left as it was, it would conduct any heat energy directly into the outside. Mawditt and Kay decided to shear it off, again, flush with the existing building, and replace it with a wooden balcony. As with the gutter, this doesn’t eliminate the thermal bridge but it does reduce the problem to an acceptable level. Once the thermal bridges were dealt with, upgrading the thermal envelope was the next priority. Mawditt relied upon external wall insulation, together with passive standard, timber framed, triple-glazed windows. 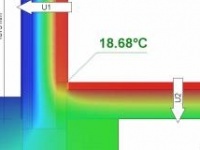 The compromise here was a 20mm layer of Spacetherm, which uses Aerogel insulation. This is an ultra-high performance — and consequently expensive — insulant that’s bonded to chipboard, which was laid directly over the original floor. You don’t get the same thermal standard as the rest of the house, but that 20mm has cut heat loss through the utility floor by almost 60%, reducing the U-value from 0.59 to 0.25. With an eye to what might be learned from the experience, Mawditt deployed a range of sensors and data loggers about the house, both before and after the build. He’s now been through two heating seasons since the work was completed, and the results make for fascinating reading. Take overheating for example. Mawditt points out that a misconception has grown in the last few years that low energy houses are somehow more prone to overheating than ‘traditional’ houses. He notes too that as the pressure for space grows, it’s become increasingly common to put bedrooms into roof areas that used to be ventilated loft space. Before the retrofit, the summer temperature in the bedrooms reached an unbearable 35C. Since the project was completed however, the data loggers have recorded maximum summer temperatures of 26C in the bedrooms. In part this is thanks to the external placement of the insulation. During the winter, it keeps the heat from escaping from the house, but during the summer, it keeps it from getting in. In addition, the render layer on the outside is deliberately light in colour, so that it radiates away solar energy rather than absorbing it. Additionally, the new windows have much better solar control. Based on monitoring data, overall energy use in the house has been reduced by 73%, while the energy required for heating alone is down 90%. In the year before the works were completed, the total gas bill came to £1200. 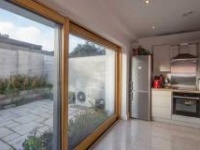 In the first year after completion, gas costs for both space and water heating came to £225. Mawditt had anticipated that total space heating demand would just about meet the Enerphit standard of 25 kWh/m2/yr. In the first year, however, it didn’t get above 14 kWh/m2/yr, and following further tweaks to the system, it’s now down to 12 kWh/m2/yr. He notes too that he inherited a relatively new boiler from the previous owner that is grossly oversized for the house’s heating needs, but he plans to replace it in future. His monitors also tracked relative humidity (RH) and CO2 concentrations. RH should lie between 40% and 60%. Much lower than 40% can lead to a feeling of dryness and discomfort; much higher than 60% can lead to condensation and mould growth. Average relative humidity in the main bedroom came in at 57% in the first year post-renovation, within the comfort band, but slightly high due to the recent re-plastering of the room and the associated moisture content. The average relative humidity on this floor has since fallen to 48%. Mean CO2 levels should ideally be within 1500ppm. The ventilation system air flows have been commissioned to ensure this threshold is not exceeded, which has been confirmed by the logged data. For more information about this project visit: fourwalls-uk.com/blog. Ian Mawditt, owner and designer of the project, is an independent building performance researcher. Originally an M&E engineer, he returned to university some years ago to complete a masters in sustainable architecture. Since establishing his own business, his key professional activities include field-based building research in new and existing buildings, evaluating energy performance and targets, and occupant comfort. Much of this research has been used to support various revisions to the building regulations and related approved documents for Part L and Part F. He is also an expert advisor to the Technology Strategy Board (now Innovate UK) on both their Building Performance Evaluation and Retrofit for the Future Programmes. Building type: 1960s two-and-a-half storey detached cavity wall house with new extension. Floor area of 188 sq m.
Before: New A-rated (SEDBUK 89.2% eff) gas boiler installed by previous owner, but connected to the original single pipe, conventional open vent system, utilising skirting radiators throughout entire building. After: Boiler retained, but connected to a new sealed twin pipe system. Radiators are small panel type, between 300 and 500 watts depending upon room size. Minor efficiency issue – boiler is now grossly over-sized (size for a big ineffi cient building), meaning that it runs less effi ciently. It was felt wasteful to discard such a new boiler, but it will eventually be replaced with a smaller unit. After: Paul Novus 300 heat recovery ventilation system. EN 308 certifi ed effi ciency of 94.4%. All ducting is Lindab SAFE galvanised steel – double sealed, airtight installation. 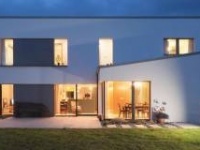 Green materials: Cellulose (loft) and wood fibre (IWI) insulation materials used. Sedum extensive roof layer dressing to extension roof.